“Resolution is pleased to see the Justice Select Committee have taken on board many of the points we made during their inquiry. MPs have listened to the legal profession and recognised that the vision put forward in the Government’s white paper won’t work for British families. “Incorporating EU law into domestic legislation on its own won’t work as we need to have reciprocity and cross border recognition. Without reciprocal rules, there can be no legal certainty in outcomes with all the ensuing complications, delays and potential costs for families and children. There must also be suitable transitional provisions in case not all negotiations are concluded before the UK has formally left the EU. 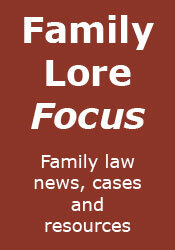 “We accept that family law will not be the highest priority for this Government during the Brexit negotiations. However, for the thousands of UK citizens that are married and living overseas, and EU citizens that are married and living in the UK, issues concerning cross-border family law will be of critical importance should their relationship come to an end. “We therefore urge the Government to take the Justice Select Committee recommendations on board and provide much needed confidence and certainty for families and children as Britain leaves the European Union”. "Do your kids a favor – don’t have any."